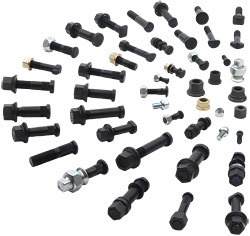 The Wheel Bolts and Nuts compose the Company´s products line that grows more in the present time. The huge success and real acceptance by consumers leads to ZM to invest heavily in the business. Modern equipments of cold forming are used in the production facilities in order to provide high quality to the line. The products are sold on the original market - OEM - and spare parts - Aftermarket. Its applications include cars, vans, trucks, buses, waggons, etc.. Among the brands that they destined it is possible to include Mercedes-Benz, Volvo, Scania, GM, Volkswagen, Ford, Fiat, Agrale, Randon and other Waggons. See more Wheel Studs in our online catalog click here.